There are six first-ever releases of works new to Katchen’s recorded repertoire in this Audite twofer. It documents recitals for RIAS Berlin in February 1962 and May 1964, the latter given only five years before his untimely death from leukaemia at the age of forty-two. The Liszt Sonata is the major work that he didn’t live to record commercially, and it receives a reading of visceral intensity. From an almost sullen start it gathers in power and superb technical address to generate a reading of leonine authority and considerable poetic refinement, the two held in near-perfect equipoise. Lyrical imperatives and digital accuracy combine with a flexible but never over-elastic pulse to create an experience engrossing and at times overwhelming. What remains most impressive about this performance, even beyond this, however, is Katchen’s narrative sense. This is one of those rare performances of the sonata where one feels, however naively, that we have been on a real journey that has carried us through successive emotive states and reached the only true and musically logical destination. In that respect alone it is a remarkable performance. 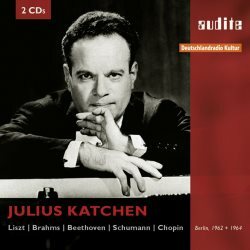 The rest of the first disc is given over to a composer whose music Katchen played with such insight, Brahms. The Seven Fantasies, Op.116 are played with real insight into their very particular sound world, sympathetically drawing out their expressive nuance and sense of melancholy and withdrawal. For all his virtuoso standing Katchen was a profoundly lyric performer and this set underscores the point. So do the two pieces from the Op.118 set, the Intermezzo and Romanze. Given that these are largely unedited performances one would expect a few finger slips, but they are – as in the Liszt sonata – of negligible significance. I freely admit I played these two pieces from the Op.118 set repeatedly and held up my reviewing responsibilities, so affecting were Katchen’s performances of them. There is more Brahms on disc two, a stormy performance of the Scherzo in E flat minor, boldly argued and living dangerously. Both Beethoven performances are new to his discography. The Rondo, Op.129 (Rage over a Lost Penny) scintillates and the Variations in C minor finds Katchen in discerning form, marrying structural imperatives with digital drive. His Chopin is fluent and charismatic and there is the great advantage of pieces once more appearing for the first time in his discography, namely the two Nocturnes - Op.9 No.2 and Op.27 No.2. They receive properly rich readings, and there is no need to cite, say, Lortat, Cortot or Moiseiwitsch here, as Katchen stands at a remove from that lineage. The 1962-64 tapes sound splendid and with a fine booklet note this production is an exceptionally fine addition to Audite’s already admirable sequence of RIAS releases.